After several false starts, Denver International Airport opened in February 1995, replacing Stapleton International Airport. It sits on 52 square miles of land and is 25 miles away from downtown. 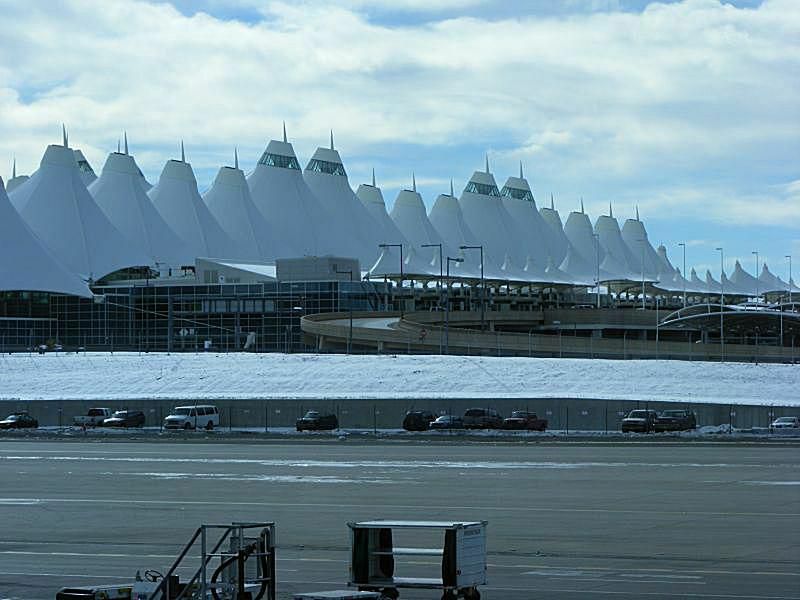 Denver is currently the 15th-busiest airport in the world and the fifth-busiest airport in America. The airport handled a record 54 million passengers in 2015. The airport has a flight search function that checks departures, arrivals and connections. There's also a list of all the airlines that serve the facility, along with information on their locations, whether they have curbside check-in and contact phone numbers. Public Transportation: The University of Colorado A Line, which will open on April 22. 2016, connects the airport with downtown Denver and communities along I-70. It connects at the main Union Station to the C, E and W light rail lines, along with local and regional buses and the G and B commuter rail lines that will connect later in 2016. Parking: Denver International has five parking options for travelers: Garage ($24 a day); Economy ($13 a day); Shuttle ($8 a day); Valet ($33 a day); and Short Term ($96 a day). Airport Map: Denver International's website features an interactive map with information on services, parking, directions and ticket counters. Security Checkpoints: The airport has three main TSA checkpoints in Terminal North, Terminal South and the Bridge. The South checkpoint is open 24 hours a day. Airlines: 15 carriers offer nonstop flights to more than 170 destinations worldwide including over 20 international destinations in nine countries. The City and County of Denver have a “one percent for art” ordinance that is designed to highlight art in public places, including the airport. The airport has nearly 30 site-specific works, including sculptures, murals and other installations. It also offers temporary exhibitions in collaboration with museums, cultural institutions and arts organizations. Past exhibits include photos of Japanese gardens, 45 Years of Photographing Colorado and The Magic of Glass. Denver International Airport also offers “Events @ DEN,” an ongoing series of public family-friendly entertainment, activities, music, movies and more to its open-air plaza located on Level 5 between Jeppesen Terminal and the Westin Hotel. It's accessible to the new University of Colorado A Line station at DEN (commuter rail line tickets are $9 and good for multiple trips during the same business day), or a short walk from the airport parking garages ($3/hour). Hotels: In November 2015, the airport opened the new Westin Denver International Airport. The facility features 519 guest rooms that offer innovative technology and wall-to-wall windows with sweeping views of the Rocky Mountains, the Colorado’s High Plains, the iconic tents of the airport, and/or the airfield. It offers 37,500 square feet of conference space, 15 meeting rooms/boardrooms, two ballrooms and an open-air plaza for arts and entertainment. There's also an indoor pool and fitness center and a public plaza that will serve as a venue for entertainment and relaxation. There are also nearly 200 hotels in the area. Check guest reviews and prices for hotels near Denver airport on TripAdvisor. The facility also offers 253 parking spaces, free Wi-Fi service in the building and parking lot, a children’s seating area with iPads built into tabletops with access to games, lounge seating, indoor restrooms, eight flight information display boards and access to an adjacent Conoco fueling station. The Cell Phone Waiting Lot is the ideal place to wait for a call from your traveler letting you know they are ready for pick up at Jeppesen Terminal. While waiting for that call, you can stretch your legs with a visit to the Final Approach facility to enjoy a bite to eat while keeping an eye on flight status monitors. This facility is open from 5 am to 12 am and has public restrooms. Because traveling can cause stress and anxiety for passengers, Denver International Airport created the Canine Airport Therapy Squad (CATS) program. The program gives passengers access to a certified therapy dog offered by volunteer pet owners and their dogs. All CATS program dogs are also registered with the Alliance of Therapy Dogs; they are trained, certified and insured. The airport offers access to one dog and its owner a day, where they walk around the airport for about two hours per visit. For more information on the CATS program, please contact info@flydenver.com or call (303) 342-2000.